After one-year preparation, the 11th Beijing International Construction Machinery Exhibition & Seminar will be held in Beijing Jiuhua International Exhibition Center (BICES, 2011) in 18th October, 2011. Supported by the community, the number of exhibitors and floor space will break a new record. BICES, founded in 1989, is the longest running construction machinery exhibition in China. It is fully supported by overseas industry authorities those are from the UK, Japan, Korea, Brazil, Span, Turkey, etc. BICES is gradually promoting the products chiefly in Southeast Asia, the Middle East, South America, CIS and some other areas. 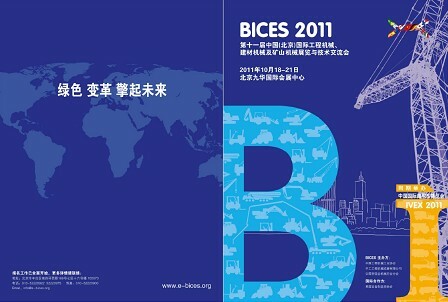 The number of BICES 2011’s exhibitors reaches 1200, and the total show area of BICES 2011 is almost 200,000sq.m. Both have achieved a 25% growth compared with the previous event. All the data shows that BICES 2011 will become an exhibition that owns the most exhibitors, the most comprehensive products and the largest scale since the beginning of its history. At the same time, BICES 2011 will become the largest and most influential one of the same kind in Asia-Pacific region this year. The scale and the influence of BICES attract more and more excellent enterprises such as , XCMG, , ZOOMLION and SBM always treat BICES as an important platform to show their products and brands. Note:Welcome to the first "China-asia-europe exposition" exhibition of Shanghai Shibang Machinery's booth, you will get a contract discount of 2%.